Are you ready to be #Extraordinary? Get ready to #GiveExtra! The Extraordinary Give is the largest day of giving in Lancaster County, Pa. For the past six years, the Extraordinary Give has raised $31 million for more than 500 organizations! 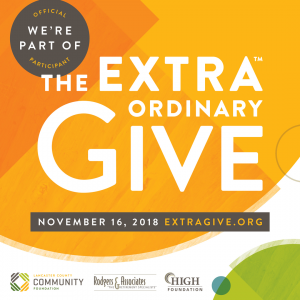 This year, on November 16, every dollar donated at ExtraGive.org will be stretched with at least $500,000 from the Lancaster County Community Foundation, Rodgers & Associates, The High Foundation, and other community partners to support the causes you care about. Feeling inspired to give? Please consider making a contribution to HDC MidAtlantic on November 16. Your gift makes a real impact on the lives of the people we serve. Thanks for your generosity and support!